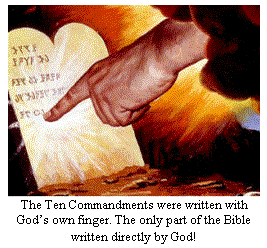 The 10 Commandments were never called the "Law of Moses" – but rather the "Law of God!" It grieves us that there are more and more people today even Christians who are working towards finding a way to rationalize why they need not obey the 10 Commandments. "Blessed is the man who walks not in the counsel of the ungodly, nor stands in the path of sinners, nor sits in the seat of the scornful; but his delight is in the law of the Lord, and in His law, he meditates day and night. He shall be like a tree planted by the rivers of water, that brings forth its fruit in its season, whose leaf also shall not wither; and whatever he does shall prosper," Psalm 1:1-3. If you find the TRUTH that God Almighty, the Creator, set in motion invisible, SPIRITUAL LAWS for our happiness and for our good, and that ALL our woes and troubles are the DIRECT RESULT of our rejection and transgression of those laws - you'll probably say… "But I've been taught that those laws were abolished by Christ Jesus!" Or, "Why, that's a religious and theological question that I know nothing about. It has NOTHING to do with my practical, down-to-earth, everyday life anyway?" Then you're wrong! It has EVERYTHING to do with all our everyday lives and everything to do with all the bad news we hear and read about or watch on TV every day. It has everything to do with the fact that we are restless and discontented, that not as happy as we want to be or would like to be. It has everything to do with today’s chaotic world conditions, with social unrests, liberal anti-Christ anti-God beliefs and has everything to do with compromise (or as we call it today "Political Correctness") to pagan religions - especially Islam which is an evil ideology bent on destroying Jews and Christians in the name of their moon-god Allah! And, perhaps you have heard that the 10 Commandments were done away with or taught that the 10 Commandments either are the same as - or a part of, the ritualistic law of Moses and that they didn’t even exist until Moses …and that they lasted only until the First Coming of the Lord Yeshua – Jesus Christ, 2000 years ago! This is NO mere, irrelevant theological or religious question. This is the very essence of our lives; our home life, our social life, our business life and is the very crux question behind world troubles today. Strange as it may seem, the 10 Commandments have been in FULL FORCE and effect since human life has existed on this earth! The 10 Commandments constitute a Spiritual Law that is irrevocable and eternal… A law that is LOVE and the fulfilling of which is love and a law that was set in motion for our happiness to produce everything good which we have foolishly denied ourselves. The "spiritual laws" are just as active as the "physical laws"- just as breaking the "physical laws" results in "physical consequences," breaking "spiritual laws" results in "spiritual consequences!" Most suppose that the 10 Commandments “ended with Christ” and “Started with Moses” …and are done away with by calling it “the law of Moses” and ended with Christ Sacrifice. But, they do not know the difference between “Levitical sacrificial rituals, the law of Moses and the law of God! 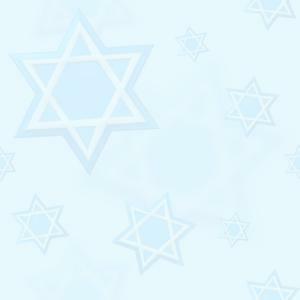 Did God reveal His Laws from the beginning, or were the 10 Commandments unknown until Moses led Israel to Mount Sinai…? 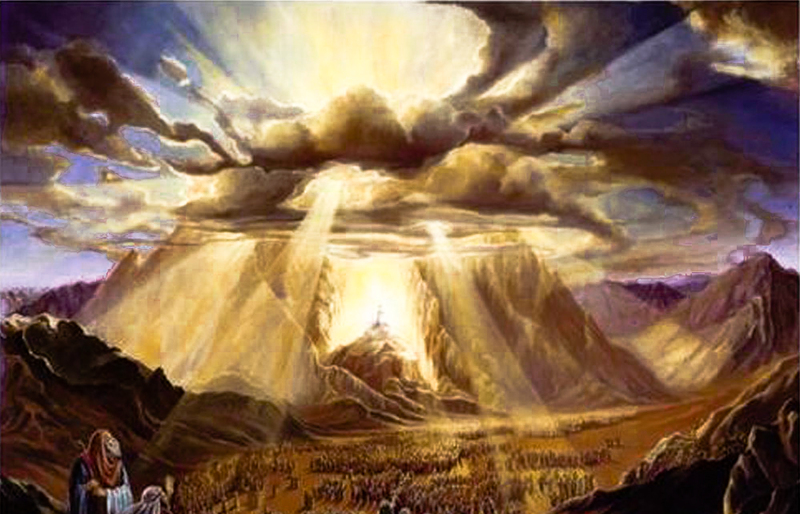 A combination of ignorance and an attempt to minimize the 10 Commandments as “obligatory for limited period of time” (dispensational) has caused many to believe that the 10 Commandments did not exist prior to Moses receiving them on Mount Sinai. Many people are aware that God gave the 10 Commandments to the Nation of Israel from Mount Sinai, as recorded in Exodus 20:1-17. This event occurred about two months after Israel left Egypt. The question many wonder about is whether these Commandments were known prior to this time, especially in light of; “Abraham obeyed My voice and kept My charge, My commandments, My statutes, and My laws,” Genesis 26:5. Since Abraham obeyed God’s voice and kept His Commandments hundreds of years before Moses, then surely those Commandments must have been known before Mount Sinai. The Bible tells us that sin is breaking God’s law (1 John 3:4). The Bible refers to sin a number of times before the time of Moses (Genesis 4:7; 13:13; 18:20; 39:9; 42:22; 50:17), so God’s law must have been revealed, at least to some people. In fact, the Bible gives evidence that the 10 Commandments were known and were understood as being important. We need to understand the Bible definition of sin; “Whoever commits sin transgresses also the law … for sin is the transgression of the law,” 1 John 3:4. And, in Romans 6:23 defines the penalty – end result of sin; “for the wages of sin is death; but the gift of God is eternal life through Christ our Lord.” In the Garden of Eden, God talked to Adam and gave him clear understandable instructions. God had to reveal to him the “spiritual” boundaries that Adam couldn’t discover on his own, without breaking God’s laws (Genesis 2:15). Adam was given instructions on how to maintain the garden. He was also commanded not to eat of the tree of the knowledge of good and evil (not to decide for himself what is right or wrong) and was told what the penalty will be for disobeying this command! Being gullible in the face of Satan’s shrewd tactics, Eve fell for his deception and ate from the tree, as did Adam (Genesis 3:4-5). Whoever or whatever someone obeys and serves is his god (Romans 6:16). Adam and Eve broke the 1st Commandment by putting another god before the Creator God. In doing so, they broke the 5th Commandment, by “dishonouring their parent” in the sense that Adam was a created son of God (Luke 3:38). Their sin also involved “stealing” (the 8th Commandment) in that they took something that was not theirs. Eve lusted for the forbidden fruit. Lusting is “coveting,” which breaks the 10th Commandment. Breaking one Commandment leads to breaking all of them (James 2:10), If you break one you eventually break them all! 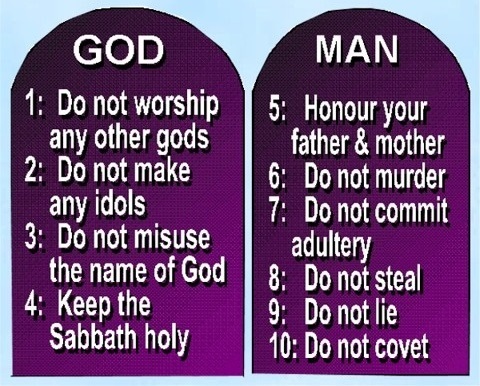 The 1st and 2nd Commandments state: “You shall have NO other gods before Me” (God) and “You shall NOT make for yourself a carved image … you shall not bow down to them nor serve them,” Exodus 20:3-5. Hundreds of years earlier God was working with the patriarch Jacob. After God spoke to Jacob …notice what he did with the idols that were among his household; “…And Jacob said to his household and to all who were with him, ‘Put away the foreign gods that are among you, purify yourselves, and change your garments So, they gave Jacob all the foreign gods which were in their hands, and the earrings which were in their ears; and Jacob hid them under the terebinth tree which was by Shechem,” Genesis 35:1-4. Here we see Jacob understood the importance of getting rid of idols and only worshipping the true God. The 3rd Commandment says: “You shall not take the name of the LORD your God in vain,” Exodus 20:7. It seems the patriarch Job lived before Moses, about the time of Isaac (Jamieson-Fausset-Brown Bible Commentary, quoting the historian Eusebius). Job was concerned that his children might have been taking God’s Name in vain, and he knew that was wrong; “So, it was, when the days of feasting had run their course, that Job would send and sanctify them (his children), and he would rise early in the morning and offer burnt offerings according to the number of them all. For Job said, ‘It may be that my sons have sinned and cursed God in their hearts.’ Thus, Job did regularly,” Job 1:5. 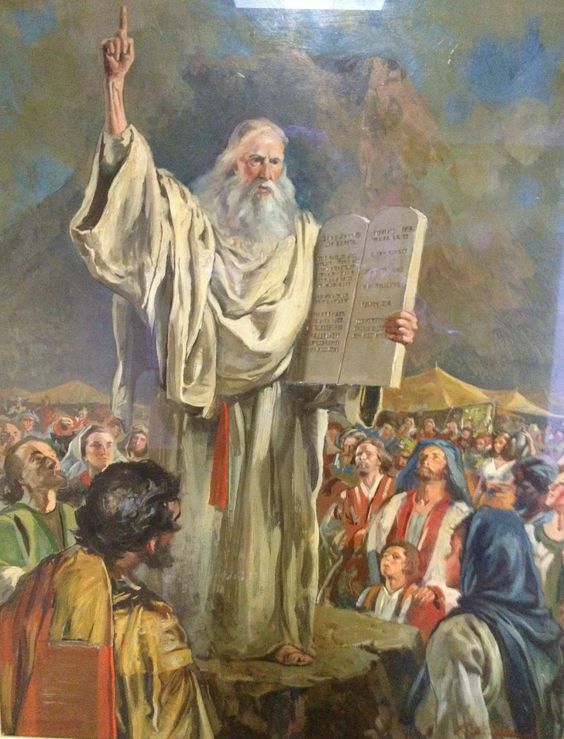 The 10 Commandments were known before Moses, and they are still important laws for all peoples today. God gave His laws for our good. They are based on love and help us know how to show love to God and our fellow man. Interestingly, Israel was reminded to remember the Sabbath even before they came to Mount Sinai. This was when God gave them manna to eat. “Then he (Moses) said to them, ‘This is what the LORD has said: “Tomorrow is a Sabbath rest, a holy Sabbath to the LORD.”’ … “Now it happened that some of the people went out on the seventh day to gather, but they found none. And the LORD said to Moses, ‘How long do you refuse to keep My Commandments and My laws?’ Exodus 16:23-28. So even before they arrived at Mount Sinai - God expected the people to obey His Commandments, including the Fourth Commandment. The 5th Commandment says to: “honour your father and your mother,” Exodus 20:12. Jacob and Esau both had dishonoured their parents, but Jacob finally did obey. “Esau saw that Isaac had blessed Jacob and sent him away to Padan-Aram to take himself a wife from there, and that as he blessed him he gave him a charge, saying, ‘You shall not take a wife from the daughters of Canaan,’ and that Jacob had obeyed his father and his mother and had gone to Padan-Aram,” Genesis 28:6-7. The 6th Commandment: “You shall not murder,” Exodus 20:13. God told Cain he was to rule over and avoid sin, as anger was in Cain’s heart. “So, the LORD said to Cain, ‘Why are you angry? And why has your countenance fallen? If you do well, will you not be accepted? And if you do not do well, sin lies at the door. And its desire is for you, but you should rule over it.’ Now Cain talked with Abel his brother; and it came to pass, when they were in the field, that Cain rose up against Abel his brother and killed him,” Genesis 4:6-9. Cain’s anger led to the sin of murder. Cain “murdered” Abel and “lied” to God about it! Another one of God’s Commandments were broken as we read in verse 9. After the Flood, people knew that God was against murder and demanded a penalty for it. “From the hand of every man’s brother I will require the life of man. Whoever sheds man’s blood, by man his blood shall be shed. For in the image of God He made man,” Genesis 9:5-6. The 7th Commandment: “You shall not commit adultery,” Exodus 20:14 - was known and understood by Joseph when he fled from Potiphar’s wife. “And it came to pass after these things that his master’s wife cast longing eyes on Joseph, and she said, ‘Lie with me.’ But he refused and said to his master’s wife, ‘Look, my master does not know what is with me in the house, and he has committed all that he has to my hand. There is no one greater in this house than I, nor has he kept back anything from me but you, because you are his wife. How then can I do this great wickedness, and sin against God?’” Genesis 39:7-9. God also had warned Abimelech, king of Gerar, not to commit adultery with Sarah. “God came to Abimelech in a dream by night, and said to him, ‘Indeed you are a dead man because of the woman whom you have taken, for she is a man’s wife,’” Genesis 20:3. The 8th Commandment: “You shall not steal,” Exodus 20:15 - was apparently on Jacob’s mind when he discussed his wages with Laban. “So, my righteousness will answer for me in time to come, when the subject of my wages comes before you: every one that is not speckled and spotted among the goats, and brown among the lambs, will be considered stolen, if it is with me,” Genesis 30:33. The 9th and 10th Commandments: “You shall not bear false witness against your neighbour” and, “You shall not covet,” Exodus 20:16-17, have been breached ever since Eve saw and desired (coveted) the fruit from the tree of the knowledge of good and evil. Adam ate of it as well (Genesis 3:6), and then both of them justified their actions (verses 10-13). The result of their disobedience to God was that they were kicked out of the Garden of Eden. 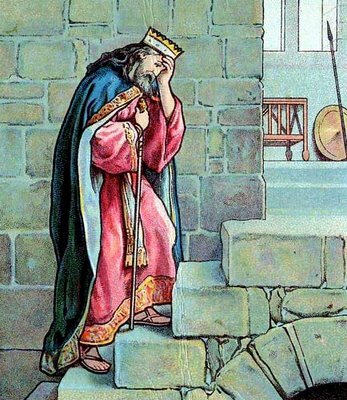 King David who was called “called a man after God’s own heart!” (1 Samuel 13:14; Acts 13:22) God made a statement that He has never made about any other person in the Bible …when He said David “was a man after His own heart.” Why did God say this and how would we feel if God made this same statement about us as He did about David? There could not have a higher praise or recommendation than this! David broke the following Commandments; covetousness as he lusted after Bathsheba who was married to Uriah the Hittite and therefore committed adultery, lied which led to murder and then dishonoured God the Father. “But now your kingdom shall NOT continue: the LORD has sought him a man after His own heart, and the LORD has commanded him to be captain over His people, because you have NOT kept that which the LORD commanded you,” 1 Samuel 13:14. Why did God say this about David? This world is as mess today because Adam and Eve sinned. 1 John 3:4, says that sin is transgression of the law, so we know that the 10 Commandments had to exist from the beginning. We cannot sin if there is no knowledge of the law. This is the purpose of the 10 Commandments. The law points out your sin, which in turn points you towards Christ who is the remedy. If there is no law, then there is no transgression and if there is no transgression, there is no sin and if there is no sin there is no need for a Saviour! We would no longer need to repent of our sin and ask Yeshua (Jesus) for forgiveness as there would be no law and hence no sin. The 10 Commandments existed before Moses …and are still important today! So, we can see that the 10 Commandments were known before Moses, and they are still important laws for all peoples today. God gave His laws for our good (Deuteronomy 10:13). The Apostle Paul wrote about it in Romans 2:13; 3:31; 6:1-2, 14-15; 7:12. What strange statements these verses would all be from Paul if the law was nailed to the cross! Imagine calling a law that has ended, “Holy, Just and Good.” They are based on love and help us know how to show love to God and our fellow man (Romans 13:9-10). “For this is the love of God, that we keep His commandments. And His commandments are not burdensome,” 1 John 5:3. Read Psalm 119 as well. 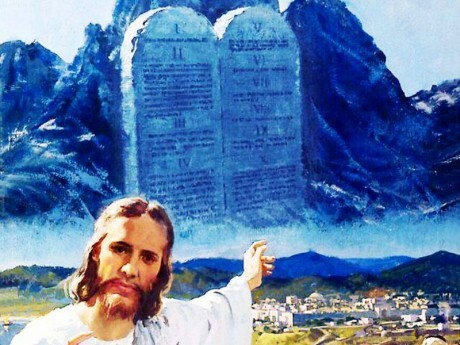 Were God’s 10 Commandments abolished in the New Testament? Or does the New Testament continue to teach and uphold all 10 Commandments? Does it matter whether we obey the Commandments? Wouldn't it be wonderful if we could ask Yeshua (Jesus Christ) if keeping the Commandments is still necessary, especially to receive eternal life? Actually, that is not as difficult as it may seem! Many people have heard that our LORD abolished the Old Testament laws? Here again Yeshua (Jesus) gives us His own direct response; “Do not think that I have come to abolish the Law or the Prophets; I have not come to abolish them but to fulfil them. I tell you the truth, until heaven and earth disappear, not the smallest letter, not the least stroke of a pen; will by any means disappear from the Law until everything is accomplished. Anyone who breaks one of the least of these commandments and teaches others to do the same will be called least in the kingdom of heaven, but whoever practises and teaches these commands will be called great in the kingdom of heaven,” Matthew 5:17-19. Again, Yeshua spoke clearly and to the point! God’s law has not been abolished …and, according to Christ’s own words, anyone who teaches so is directly contradicting Him and is in serious spiritual trouble. Many assume they do not need to keep God’s law because Christ “fulfilled” it. But these people fundamentally misunderstand Christ’s clear words. The word translated fulfil in this passage means “to make full, to fill to the full” (Vine’s Complete Expository Dictionary of Old and New Testament Words; “Fill”), and that is exactly what our Lord did. 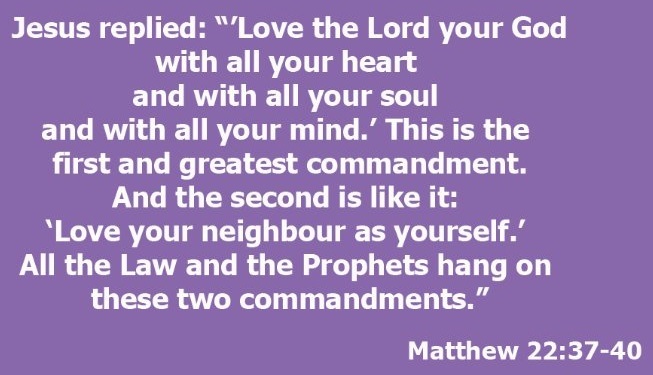 He perfectly kept the 10 Commandments and completely filled their meaning. He showed their spiritual intent, explaining that unjustified anger equates with murder (Matthew 5:21-22) …and lust is mental and emotional adultery (Matthew 5:27-28). Yeshua expanded the intent of the 10 Commandments. He also made it unquestionably clear that God treasures people who obey His laws. But, anyone who transgresses His commandments quickly diminishes God’s favour toward Him. We have seen that Yeshua in the 10 Commandments show us that the Lord endorsed them in Matthew 5:17-20 they display God’s Character and show us the best way to live. Galatians 3:21-25 and Romans 8:1-4; (a) They warn us of danger; “You shall not….” and (b) They expose sin! There is simply NO excuse for believing that Yeshua (Jesus) came to abolish any Commandments of God. On the contrary, when asked, “Good Teacher, what good thing shall I do that I may have eternal life?” He responded, “But if you want to enter into life, keep the commandments,” Matthew 19:16-17. Yeshua explained that obeying the 10 Commandments is a prerequisite for receiving God’s gift of eternal life. One who repents is one who simply begins keeping the “Laws of God,” because sin is the breaking of those laws (1 John 3:4). However, by keeping the LAW will not save us since we are saved by GRACE through faith in Christ. But, that true faith will produce works of obedience to God's Law!